And Still We Rise: Race, Culture and Visual Conversations, a travelling exhibition of important historical quilts is currently on show at the Bruce Museum, Greenwich. Artist and historian Carolyn Mazloomi, who has curated the show, explained it is a a "historical timeline'' which opens up the discussion ''about the history of the presence of African Americans in [the US.]" "Everybody's familiar with quilts, so it's an easy way to talk about and address difficult subject matter." "[Quilting] was a method of communication...a method of empowering people with a voice through cloth". Mazloomi asked members of the Women of Color Quilters Network, which she founded in 1985, to select a year in African American history to mark with a quilt. 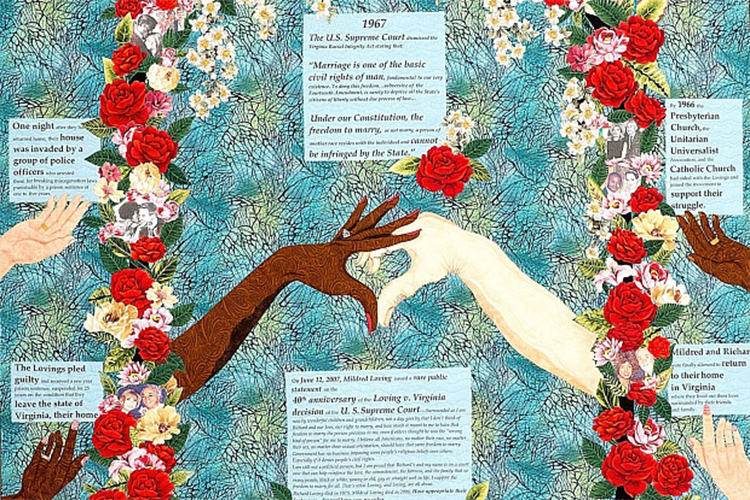 Forty quilts were created, including one which commemorates the 1967 Supreme Court case Loving vs State of Virginia, which led to the removal of the law against interracial marriage. Other quilts commemorate important figures, such as slave-born Civil Rights activist Ida B. Wells, and key moments in the African American narrative such as the devastation of Hurricane Katrina. A quilt entitled Visionaries of Our Freedom, 2012, by Sherry Whetsone-McCall, marks the 400th anniversary since the first Africans arrived in the US, which will be the case in 2019. Mazloomi describes the quilts as "a celebration of joy... when you stand back and look at all the contributions... through all the ups and downs—and we're still here. We're still here, and still we rise." The exhibition will be at the Bruce Museum until April 24. It will then be on display at The Museum of the Shenandoah Valley, Winchester, Virginia, from September 19 to January 1 2017. For more information, see here.